View More In Subwoofer Boxes and Enclosures - Page 8. Bbox Vehicle Specific A202-10CP Dual Sealed 10-Inch Up-Firing Dodge Ram Quad Cab Subwoofer Enclosure. This enclosure is designed for 2002 - 2016 Dodge Ram Quad Cab and Crew cabs. This box has Polyfill installed inside each speaker hole pocket .This helps create more volume to the woofer. 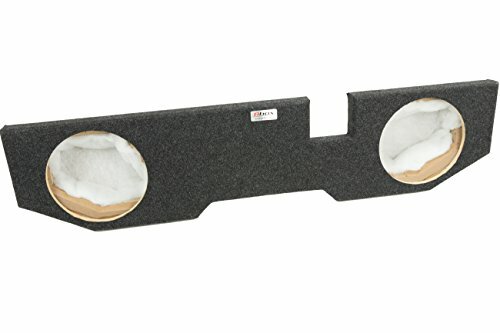 Box includes spacers to be mounted on the surface of the box to protect the woofer from the material hanging from the bottom of the seat. If you find the seat touching the top of the speakers it is recommended to install a low-line grill. This will protect the speaker. IMPORTANT: Confirm the speaker has a mounting depth of less than 6.12"". IMPORTANT:Confirm the required speaker hole cutout is no more than 9.12"". IMPORTANT:Confirm the speaker will operate properly with only .60 Cubic feet. Wire will be needed to run from the speaker to the terminal cup. It is best to solder the wire to the inside of the terminal tabs. Max Mounting Depth - 6"
(Height) 7.25" x (Width) 57" x (Depth) 13.25"
If you have any questions about this product by Atrend, contact us by completing and submitting the form below. If you are looking for a specif part number, please include it with your message.